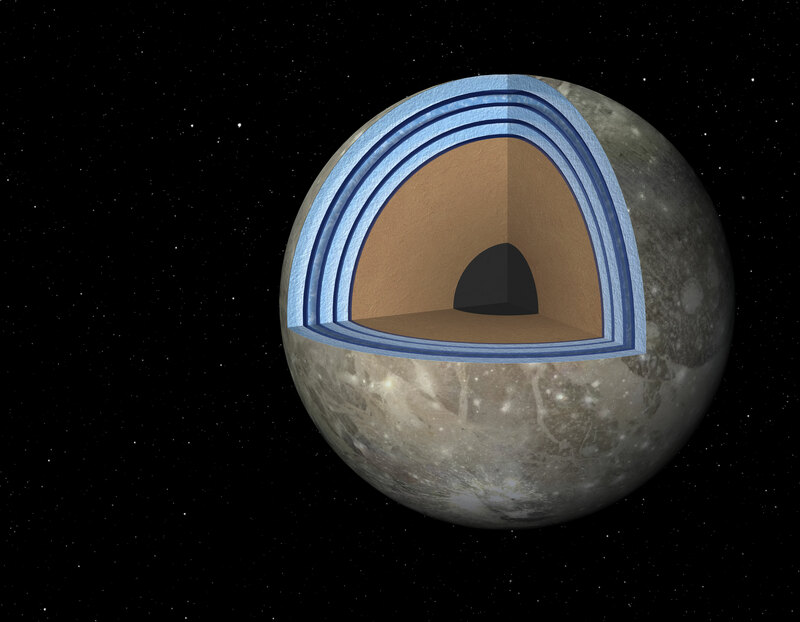 “Ganymede’s ocean might be organized like a Dagwood sandwich,” said Steve Vance of NASA’s Jet Propulsion Laboratory in Pasadena, Calif., explaining the moon’s resemblance to the “Blondie” cartoon character’s multi-tiered sandwiches. The study, led by Vance, provides new theoretical evidence for the team’s “club sandwich” model, first proposed last year. The results support the idea that primitive life might have possibly arisen on the icy moon. Scientists say that places where water and rock interact are important for the development of life; for example, it’s possible life began on Earth in bubbling vents on our sea floor. Prior to the new study, Ganymede’s rocky sea bottom was thought to be coated with ice, not liquid — a problem for the emergence of life. The “club sandwich” findings suggest otherwise: the first layer on top of the rocky core might be salty water. NASA scientists first suspected an ocean in Ganymede in the 1970s, based on models of the large moon, which is bigger than Mercury. In the 1990s, NASA’s Galileo mission flew by Ganymede, confirming the moon’s ocean, and showing it extends to depths of hundreds of miles. The spacecraft also found evidence for salty seas, likely containing the salt magnesium sulfate. Previous models of Ganymede’s oceans assumed that salt didn’t change the properties of liquid very much with pressure. Vance and his team showed, through laboratory experiments, how much salt really increases the density of liquids under the extreme conditions inside Ganymede and similar moons. It may seem strange that salt can make the ocean denser, but you can see for yourself how this works by adding plain old table salt to a glass of water. Rather than increasing in volume, the liquid shrinks and becomes denser. This is because the salt ions attract water molecules. By modeling these processes using computers, the team came up with an ocean sandwiched between up to three ice layers, in addition to the rocky seafloor. The lightest ice is on top, and the saltiest liquid is heavy enough to sink to the bottom. What’s more, the results demonstrate a possible bizarre phenomenon that causes the oceans to “snow upwards.” As the oceans churn and cold plumes snake around, ice in the uppermost ocean layer, called “Ice III,” could form in the seawater. When ice forms, salts precipitate out. The heavier salts would thus fall downward, and the lighter ice, or “snow,” would float upward. This “snow” melts again before reaching the top of the ocean, possibly leaving slush in the middle of the moon sandwich. “We don’t know how long the Dagwood-sandwich structure would exist,” said Christophe Sotin of JPL. “This structure represents a stable state, but various factors could mean the moon doesn’t reach this stable state. Sotin and Vance are both members of the Icy Worlds team at JPL, part of the multi-institutional NASA Astrobiology Institute based at the Ames Research Center in Moffett Field, Calif. The results can be applied to exoplanets too, planets that circle stars beyond our sun. Some super-Earths, rocky planets more massive than Earth, have been proposed as “water worlds” covered in oceans. Could they have life? Vance and his team think laboratory experiments and more detailed modeling of exotic oceans might help find answers. Ganymede is one of five moons in our solar system thought to support vast oceans beneath icy crusts. The other moons are Jupiter’s Europa and Callisto and Saturn’s Titan and Enceladus. The European Space Agency is developing a space mission, called JUpiter ICy moons Explorer or JUICE, to visit Europa, Callisto and Ganymede in the 2030s.